Once the weather starts to warm up, Jon starts hinting that he would love me to make something with tomatoes, jalapenos, cilantro and onion that he can enjoy while drinking a Sol. In other words, he wants pico de gallo I have been making my pico de gallo recipe for 7 years now and it still always takes me back to Cabo. So last weekend I got home to find 3 huge bags of tomatoes sitting on the counter ... not such a subtle hint, is it?? He had been talking about it for a few days so I wasn't completely surprised - the man had a serious craving going on! He also sharpened the knife so I'd be ready to go, so a few hours later we were enjoying some awesome pico. What does that have to do with this recipe? Well I had a bunch of cilantro left over as well as a jalapeno, and I planned on making chicken so that's how this recipe came to be. I created this one on the fly and it was really, really good! Spicy but light and healthy with some brightness from the lime and cilantro. It also only took about 25 minutes to pull together making it a great weeknight meal. Mix all of the marinade ingredients except the lime juice. Pour over chicken and let marinate in the fridge for a few hours. A half hour before you are ready to cook, add the lime juice. Heat most of the olive oil in a large sauté pan or wok. Add the chicken and cook several minutes until done. Transfer to a plate and keep warm. Add the rest of the oil to your pan; add the jalapeno, garlic, and red pepper slices. Saute 1-2 minutes. Mix the soy sauce, peanut butter, broth, chili garlic sauce and lime juice and add to the pan. Bring to a simmer for a few minutes. Taste and adjust for heat. 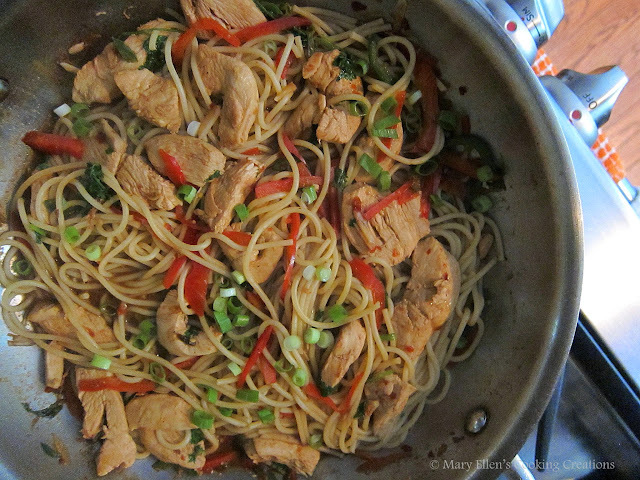 Return the chicken to the pan and add the noodles and cilantro; toss to coat.